Systec's Load Rotation Device (LRD) is a very effective method for automatically rotating loads in 90 degree increments. As with all Systec conveyor and devices, the LRD is an all welded steel construction, using precision laser cut parts for exact fit and function. This is a very low maintenance device applying the most advanced safety designs and features. It is extremely friendly with pallets as well. Dual lane, positive drive delivered to the load through the load carrying rollers, ensuring positive load movement from one end of the conveyor line to the other. 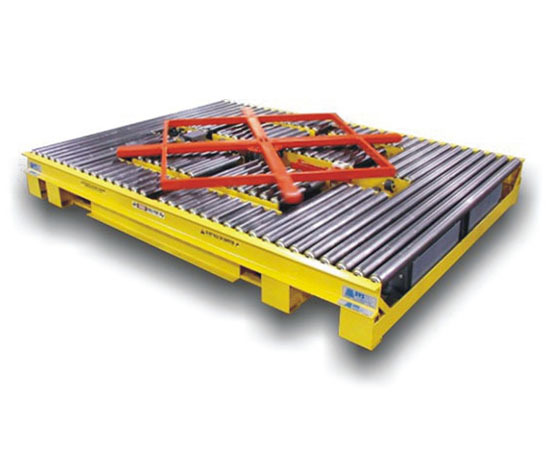 Square and cross-bar head design provides full lift, support and stability as the load is raised and rotated. High strength steel guides and nylon bushings keep all the lift head components aligned for accurate load placement. Heavy duty pneumatic actuators are positioned on the outer corners of the lift head mechanism to ensure equal lift and steady load movement while the load is being rotated. Even loads off-center are lifted and turned with a balanced and stable effort.